Growing up in 1950s California, young Anson William Heimlich showed very little promise. Clumsy, unsure of himself, and made to feel like a failure by his disappointed artist of a dad, Anson started working odd jobs as a teenager to help support his family. His boss at one of these jobs, an aging African-American janitor named Willie, unexpectedly became a mentor -- and the lessons he taught young Anson proved to be invaluable throughout his subsequent career as an actor, director, and entrepreneur. mentoring Shailene Woodley on the set of The Secret Life of the American Teenager and many more. This compelling read has a cross-generational and broad appeal, combining all the fun of a celebrity memoir with the emotional impact of an inspirational bestseller. 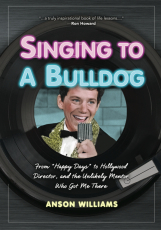 With Singing to a Bulldog, Anson Williams brings his gift of storytelling to a new medium in a book that is sure to touch readers' hearts and lives as profoundly as Willie once touched his.